The high-tech changed the world a lot. Shortly after some architects just used 3d rendering and animation to substitute those out-of-date methods, the adoption of VR is taking people by storm. You don’t have to wake up to the big gap between you and your most successful counterpart and feel extremely regret after they have used VR to steal your clients for a long time. Action now. Read through this article, you will find the answer. Why do I need VR to present my projects? 1. VR technology offers you an edge on your competitors. Every architect has a sharp eye for the limitation of 3d renderings and animations. The best 3d rendering you have ever seen is no more than a picture. The sense of accuracy is the only thing the renderings and animations can give to your potential clients. But VR enables them to walk around and check every detail by themselves. They can actually feel it. When a customer strongly feels something real and your presentation fulfill their imagination, he or she will more likely to leave your rivals behind. Olivier Demangel, an architect, describes how he get shook by the amazing feeling when the first time he used VR devices to design and present his works. Frankly speaking, if VR is used as a promotion weapon by you, and on the contrast, your rivals are getting a 3d rendering or something else, those customers can make their decision easily. Without a doubt, one’s success depends on one’s blood and sweat, but one also need to consider the trend of the development of society. VR is the future. And if you can follow the trend and make some changes, you will succeed. No one wants to become Kodak and Nokia. A 3d rendering, which cost a couple of hours to make, can only offer the scene of a limited view of angle and details. 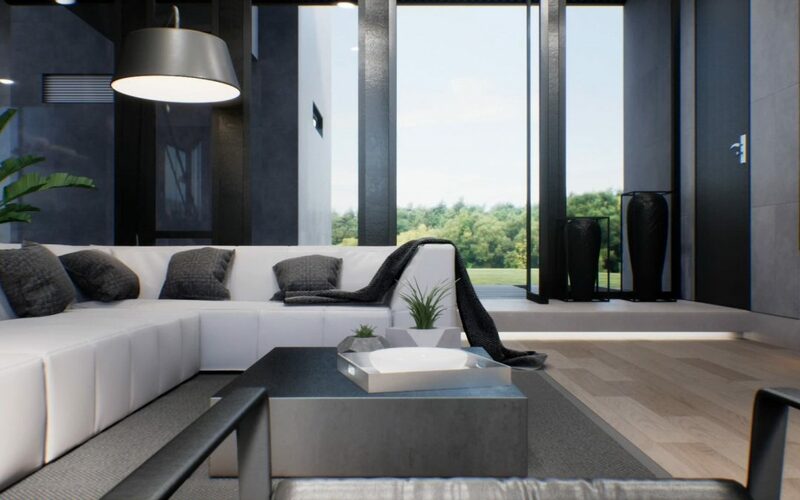 Audiences find it difficult to acquire the holistic perception of the building or interior scene unless they can watch a series of renderings of a different scene. And you know it. It is costly. VR not only allows audiences to have the holistic view of the building but also enables them to interact with the staffs of the room. They can open the door, turn on the TV and lamps, remove the sofa, and change the wallpaper. All of these, are helping you to persuade your potential customers to choose your project. 3. VR can almost apply to all kinds of architectural projects: Masterplan, residence community and interior environment. Why choose AIMIR to make VR for you? Please watch this video. It is a video made by our staffs as a sample for you to know about the quality of our VR service. As you can see from the video, in the first part of the video, the cam show you around the interior environment of the villa, from the living room to the bedrooms that situated on the second floor. You can see the kitchen, washroom and some dedicated decorations. Every detail of the house enhances a sense of reality so that it can touch the audiences as if all these things are for real. Your potential customers can simply have a closer eye on the furniture and remove them by the remoter. The project adopts the 3d panoramic roaming technique, the viewers can walk to any places where they would like to go freely. What’s more, viewers are able to transfer themselves to other places in one second by using the remoter. Just imagine that you are playing a 3d game such as PLAYERUNKNOWN’S BATTLEGROUNDS, Call of Duty and The Sim. The only difference is that you are playing something in your future home rather than some strangers’ house. Here is another videos showing you the beauty of VR. There is no doubt that AIMIR is an innovative company, which lends itself to researching and developing the state-of-the-art technologies. The aim of AIMIR is to offer better service for our clients. With professional skills and rich experience, AIMIR can provide you the high-quality VR service with the fair price in an effective way. If you have any projects that need our service, please contact us without hesitation.